In support of two comprehensive USA tours this year and on the heels of splits with Former Selves, Sky Stadium and Trudgers, Greenspon has finally offered his first official follow-up album to 2010's "Unveiling" album and "Common Objects" 12" LP. Greenspon effortlessly transforms gentle progressions of soothing guitar notes into a graceful choir of blurry tape collage. The six pieces on "Maroon Bells" are concise recollections of a very specific set of personal memories: those first times you had dreams of disappearing, seeing a city from the mountains, being dwarfed by the skeleton of a skyscraper, and the deafening railroad tracks that threaten the hope of sleeping to dream once again. First edition of 100 chrome cassettes dubbed in real-time with full-color labels and doublesided printing on heavyweight gloss stock. Second edition of 84 CDrs in cardboard jackets. Third edition of 150 cassettes. Fourth edition of 276 CDrs in plastic sleeves. 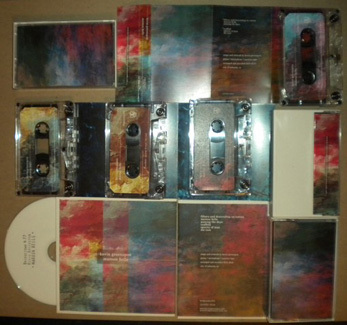 Fifth edition of 100 cassettes.